Pratap Morey is a Mumbai-based artist with a post-graduate diploma in Indian Aesthetics from Mumbai University and a graduate degree in Fine Art from Vasai Vikasini College of Visual Arts. Pratap has lived and worked in Mumbai for the most part of his life, and has been constantly displaced by the city’s shifting facades. He seeks inspiration from his immediate surroundings, exploring the spatial existence of its residents and the dualism of a colossal urban sprawl where vacant spaces are rapidly transformed into formidable structures. 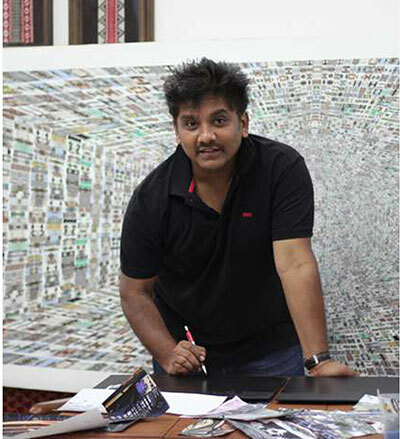 The artist uses a combination of digital photographic images, archival prints, architectural drawings and engravings in his intricate paper works. Each work delves into the overarching themes of construction, redevelopment and displacement — which are immediate concerns in a contemporary urban environment. The radical proliferation of urban spaces is an urgency that Pratap’s practice abstracts and presents to the viewer in his version of relief sculpture. The structural elevations in his works are restrained deliberations to amplify and reveal movement and metamorphosis as well as create an illusion of voids. He uses the structural nature of his works as a tool to create space, utilizing formal structures like corners and the three-point perspective to draw the viewer into each of his works. I have been a resident of the city for a majority of my life and as a result I have always been in transit. Over this period, the nature of the city has changed drastically. In response to this sudden urban growth, my work is mainly about a changing contemporary geography. Especially in India, metros are undergoing a second wave of unplanned construction where old architecture is being destroyed to make way for a new, superimposed reality. By using digital photography in combination with collage and drawing, I try and capture the illusion of the modern landscape that surrounds me.